Aira Gaira, a song from Kalank, has gone viral. The song was released on April 13, 2019, and in just 2 days, the song has gathered more than 10 million views. 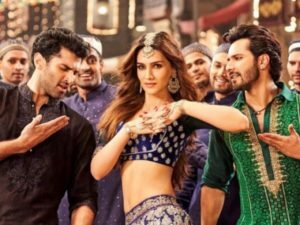 The song features Kriti Sanon, actors Aditya Roy Kapur, and Varun Dhawan. The Music of the song is by Pritam, its Lyrics are from Amitabh Bhattacharya, and its Singers are Antara Mitra, Javed Ali & Tushar Joshi. In the song, Kriti looks beautiful in a lehenga, Varun and Aditya were seen wearing a green and a black kurta. The cast of Kalank includes Madhuri Dixit, Sonakshi Sinha, Alia Bhatt, Sanjay Dutt, Varun Dhawan, and Aditya Roy Kaput. The movie is directed by Abhishek Varman. Kalank will be playing in the theaters on April 17.